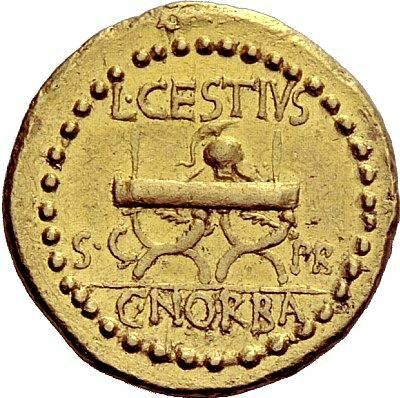 L. Cestius was one of the moneyers for the year 43 BC, and struck coins alongside C. Norbanus Flaccus. Gens Cestia was a plebeian family at Rome during the later Republic, and in imperial times. The first member of the gens to obtain the consulship was Gaius Cestius Gallus in AD 35. The family's name is commemorated on two monuments, the Pons Cestius and the Pyramid of Cestius which survive into modern times. The Cestii do not appear to have been divided into distinct families. The cognomina Gallus, Macedonicus, Proculus, and Severus were probably personal surnames, as was Pius, a rhetorician and a native of Smyrna, who was perhaps a freedman of the gens. Gallus refers to a cockerel, or to someone of Gallic extraction. Macedonicus alluded to the military service of one of the Cestii in Macedonia, while Proculus was an old praenomen that came to be used as a surname in many families. Severus was a common surname meaning "grave, serious," or "severe", while Pius referred to a person known for being dutiful or pious.